Things started to get really complicated for my main character last week when this lad showed up. Everything she thought she knew about her enemy is challenged and she has to face some pretty uncomfortable situations. 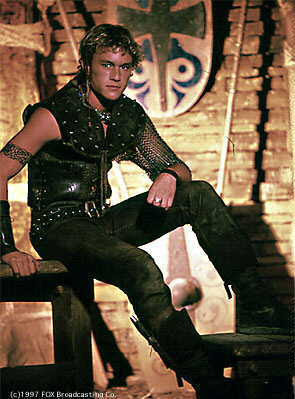 For those of you who don't know this is a picture of the late Heath Ledger in his younger years when he starred in the television show Roar. The picture was so close to my secondary antagonist that it was eerie when I came across it. That's right, secondary antagonist. This is the first time I've wrote a novel with two. It's both challenging and a lot of fun. I've reached the 50,000 mark, whoo hoo! Sadly I decided to set aside Voices of Dragons. It just wasn't pulling me in enough to stick with it. However, I will probably give it another try at a later time when my patience isn't so short. I hate giving up on reading a book. I've started reading Rampant by Diana Peterfreund, a novel about killer unicorns. Really. It has already pulled me in and caught my interest. The song that I listened to again and again while writing last week's chapter was Fear Of The Dark by Iron maiden. It may seem like an odd choice but it was oh so fitting with what was going on in the chapter. What inspired you last week? Have you made any progress on your writing lately? My book that just went out on sub has a secondary antagonist. :D You're right though, it does make things rather complicated. But when you pull it off? Ahh, so satisfying. So congrats on the 50K mark! Keep going!! I've been making progress but it's slower because the stakes are really high at this point in the story. Two antagonists sounds hard! Good luck with that, I'm sure you'll pull it off well! Lisa, that's awesome! You're right, it makes the story so much richer. I'm loving it! Thanks for the congrats! Lydia, I tend to slow down a bit when the stakes are high too. Something about the intensity makes me want to take my time. Thanks for you confidence! Thanks for dropping by Michael's and reading my interview with my heroine. Ahh, Heath. I adored him and am still saddened by the world's loss. I have multiple antagonists that make up one big enemy, although a few key players are my primaries - the faces of the enemy. But things change throughout the series and Alexis, too, will question who is the enemy and who is not. In fact, this is a big part of Book 3 that I've finally started working on again this past weekend. Progress didn't come quite as fast as I would've liked. That's what happens when you start with 45K written a year ago and have to figure out what stays and what doesn't. Excited to be writing again, though, which makes it all worth it! Congrats on your 50K! Keep goin', girl! You're very welcome N.R.! I'm really looking forward to reading your book! Kari, thank you so much! The story certainly has me pulled in! I love it when that happens. Kristie, I know, me too. Heath was an amazing artist. Thanks for the sneaky peek at elements in book 3! I can hardly wait for it and am glad to hear you're writing again! Congratulations on reaching 50k! Good luck with your writing. I've made some progress, lately--not as much as I'd like, but my story's coming along. Thanks Golden Eagle! Any progress is good progress. Keep at it and I'm certian you'll be sailing along soon! We can't wait to read your book!! I admire that you know when to stop and put something aside that you're not really getting into. Congrats on reading 50K!! WOOT! I grew up listening to Iron Maiden, there's nothing wrong with that song choice! LOL Best of luck, keep up the great work! And I love that pic of Ledger, nice! Mundies, that you that is so sweet! You put the biggest smile on my face! It's tough putting a book aside that I'm reading but sometimes I find that if I come back to it later I can get into it better. I'm so sorry to hear that Shannon! I got a few of those myself last week. But I also got a partial request so there is light ahead! There is for you too, I'm certain of it so hang in there and keep trying! Heather, He is so cute. What a horrid tragic loss. But you've given him life again. And he would be very proud to be your antagonist! Have a wonderful night! Write ON!!!! That sounds like a fun read Karlene. You'll have to tell me about it when we're in San Diego later this month! I'm so happy you made it to 50000 words.... Congratulations. I can't seem to catch up with you! I am thrilled to say I'm at 42000 right now. Thanks to your good wishes and my other blogger buddies, it seems to be working. I think it's a fantastic idea to use to antagonists. Really get the reader going in all kinds of fun directions. You'll have to let us know when your finished. Two antagonist! wow, that seems hard. I am having a hard time with just my one :D I will definitely be taking notes from you :) Happy Writing!!!! I never heard of Roar and had no idea Heath had been in a tv series. Very sad loss. I got some writing done, but not nearly as much as I'd hoped. I'll keep plugging away! I really, really need to follow your lead and find inspiration each week. I love the idea of finding pics for your characters. I recently did the same and found 3 pics of my main characters for my new YA novel I'm about to start. It's funny when you find the pics and they just seem to jump right out of your imagination, fitting perfectly with what you envisioned. Congrats on your 50,000 and good luck, sweets! Michael, 42K is great! Congrats! You may catch me yet! Stina, thanks and congrats on getting ready to query! LOL! Three antagonists, wow, now that would be a challenge! Christy, don't worry you can borrow my inspiration any time! If you're a Heath fan you should check out Roar. It isn't bad. Morgan, I know exactly what you mean. I love it when that happens! Thanks for the good luck, back at yah! That's fantastic Lindsey! I'm lucky if I can average 1k a day! Keep up the great work and you'll be done in no time.